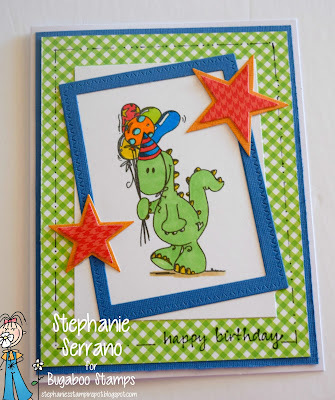 Hello peeps, it is New Release Day at Bug A Boo Stamps... Love this sweet Dinosaur. I colored with copics and the paper is from The Paper Studios and My Minds Eye. Check out what the other DT members did on the Catch The Bug Blog. This is so gosh-darn cute. I love this new image and the bright colours you used on your creation. Those stars are a fabulous addition too.